Overall, Acana Pacifica Cat & Kitten (Canada) is an above average cat food, earning 7 out of a possible 10 paws based on its nutritional analysis and ingredient list. In this case, Acana Pacifica Cat & Kitten (Canada)'s most plentiful ingredient listed is fresh whole pacific herring, which is considered a quality protein source. It also contains fresh whole pacific pilchard and whole herring meal as additional quality protein sources. Allergen alert: This product contains fresh whole pacific herring, fresh whole pacific pilchard, fresh whole arrowtooth flounder, whole herring meal, pacific cod meal, pollock oil, fresh whole silver hake, fresh whole redstripe rockfish and freeze-dried cod liver which may be problematic for cats who suffer from seafood food allergies. 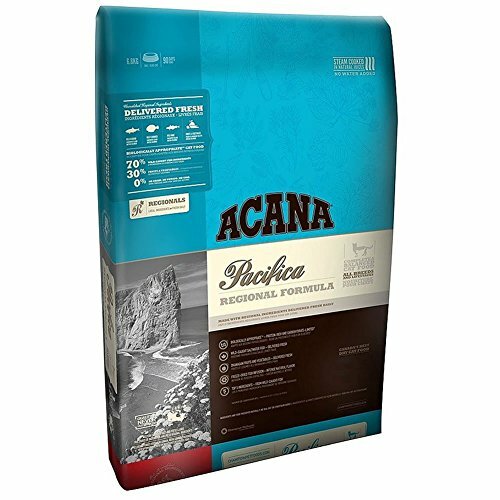 Using the calculations provided by the AAFCO, Acana Pacifica Cat & Kitten (Canada) has approximately 378 calories per 100g (107 calories/ounce), which is an average amount of calories compared to the average of the other dry cat foods in the CatFoodDB. All the product information on this page is based on data collected from the manufacturer's product website as retrieved on January 29, 2017.